John and I are planning to get married some day and I know just how costly weddings can be. My first wedding cost over $10,000 and that was 12 years ago. Since it will be both our second marriages, I want something more low key and less extravagant. We will also be paying for it ourselves. My dad footed the bill for my first one (thanks Dad! ), but I know he won’t pay for the second. I remember my wedding dress being very expensive and was one of our major costs. It was brand new and purchased from a bridal shop and I only wore it once. We also didn’t have Internet in our home back then so going online to shop for a dress wasn’t even heard of. Thankfully, times are different now and the Internet has opened up so many wonderful new options when you are looking for that perfect dress. One site that is perfect for me now as a bride-to-be on a budget is PreOwnedWeddingDresses.com, a site that connects buyers and sellers of new, sample and used designer wedding dresses. I am definitely going to check out the used wedding dresses in their marketplace when I’m ready to go dress shopping. For starters, they have a HUGE selection with over 8000 wedding dresses by more than 250 designers listed for sale. I live in a very small community and unfortunately there’s not much selection in any of the stores. Plus, its easy to shop from home and take your time picking out what you want! If you aren’t sure what you are looking for and need a little inspiration, they recommend checking out the Dresses We Love, Most Viewed, Best Deals or New Listings of the Week pages. They also have a New Dress Alert where they will email you when the dress you are looking for is added to their site. Plus, you can also find the perfect accessories to go with your beautiful dress in their Find An Accessory section. If you are a fan of a particular designer, you can with a click of your mouse, pull up all their listings. I love Vera Wang and it would be a dream to be able to wear one of her beautiful dresses! Plus, saving thousands of dollars is a HUGE perk! I enjoyed reading their Wedding Dress Guides and looking at all the celebrity wedding dresses and learning about the types of silhouettes, necklines, waistlines, sleeve style, trains and fabrics. It was a wealth of information and I have a lot to think about in terms of what I’m looking for. If you aren’t sure either, then I would definitely check out this section as well and learn about Wedding Dress 101! 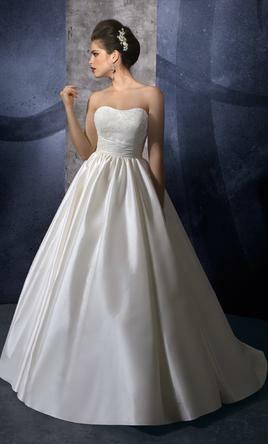 In addition, you can also sell your wedding dress on PreOwnedWeddingDresses.com and share it with another bride. This way you can recover some of your costs and your dress won’t be left in a closet never to be worn again. If my dress weren’t so old and out of style, I would list it on this site and sell it. If you are shopping for a wedding dress, I encourage you to check out PreOwnedWeddingDresses.com. When I am ready to shop for mine, I’ll be back to find my dream dress! Connect with PreOwnedWeddingDresses.com on Facebook and Twitter. This looks like a great site, I’m going to refer a friend of mine who is shopping for her wedding dress on a tight budget right now. In retrospect, I wish I would have had an option like this for my wedding dress. It’s such an enormous expense to buy new, particularly when there are obviously some really nice options pre-owned. Thanks for the tip, Stacie!!!!!! What a great post! I thought this was great information for women who may be getting married and looking for just this kind of deal. I tweeted this to share with others. Great info!!! !